Movie: "In the Heat of the Night"
When a murder occurs in a small southern town, the police go looking for possible suspects. They arrest a black man at a train station, a man who turns out to be a Philadelphia police officer and a very experienced homicide detective. Once learning this, police release him and ask for his help to solve the murder. It's always interesting to go back and watch movies like "In the Heat of the Night" decades after its release. It was so socially poignant in its day, and the fact that it remains historically and even socially relevant is a testament to its importance. The film is directed by Norman Jewison, who has directed other wonderful movies such as "Fiddler on the Roof," "Moonstruck," and "Rollerball." The screenplay is written by Stirling Siliphant, who has written other notable films like "The Towering Inferno" and "The Poseidon Adventure." It is based on the novel of the same name by John Ball. "In the Heat of the Night" is a socially conscious crime mystery that takes place in a small southern town. When a prominent businessman is murdered, it is up to Chief Gillespi (Rod Steiger) and his deputies to solve the case quickly and accurately. The first man they finger for the murder is a black man named Virgil Tibbs (Sidney Poitier), who was waiting at the train station for his ride out of town. The cops accuse him of being the murderer because that was the only reason they could figure that a black man could possibly have as much money as Virgil had on him. Once they learn Virgil is a homicide detective from Philadelphia, they quickly change their assumption. They even reluctantly ask Virgil for help since Gillespi knows his deputies are in way over their heads. Now, Virgil must conduct his investigation in a town full of bigots who have no respect for him or his authority, making his task that much harder. It's hard for us to imagine what it must have been like for an African American living in the south in the 1960's. Movies like "In the Heat of the Night" serve as a snapshot of the social climate of the times. It had a message then, and it is a message we still desperately need to hear today. The film deals with subjects like racism, police brutality, and abortion, among other things. That being said, messages are all well and good, but if the story isn't interesting, the message becomes far less effective. 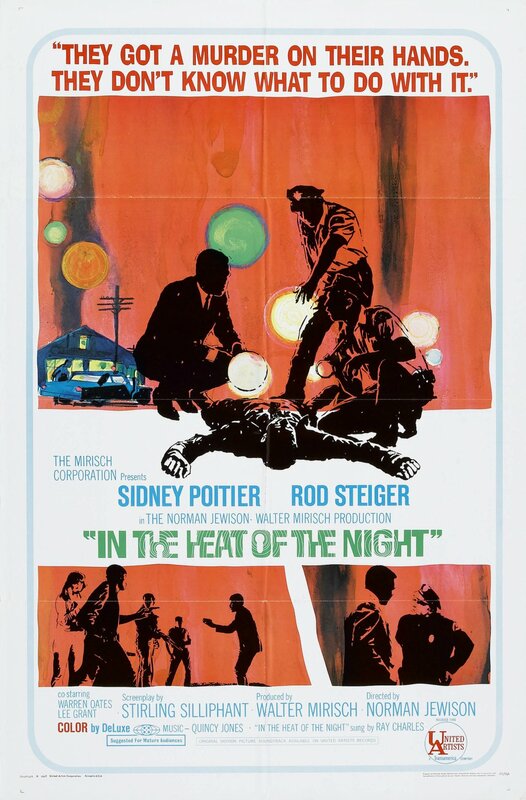 Luckily, "In the Heat of the Night" is an engaging, brilliantly acted crime drama. We become very enthralled with Virgil's investigation of this murder, as well as the strength and resolve he must show while conducting it. We see the resistance he faces from his fellow officers and from the local bigots who try to literally slap him down. We found ourselves cheering when he literally slaps them right back. The shock on that old racist's face when Virgil smacks him back is utterly priceless. Chief Gillespi also has a solid arc to his character. He is the one character who is changed the most over the course of the film. He starts off as the typical southern good ol' boy with his own bigotry and bias. As the movie continues, he learns to respect Virgil and maybe winds up a better person than who he was at the start. Steiger earned an Oscar for his performance as Chief Gillespi, and we can see why. Sidney Poitier, however, was severely overlooked for his performance, as he often was during his career, and we are shocked to see he didn't get a nomination for his efforts here. "In the Heat of the Night" is a fantastic movie that has held up well through the years and remains very entertaining and poignant. It isn't hard to see why it won the Oscar for best picture.